This Venetian Sautoir Necklace is available in a choice of 3 colours. 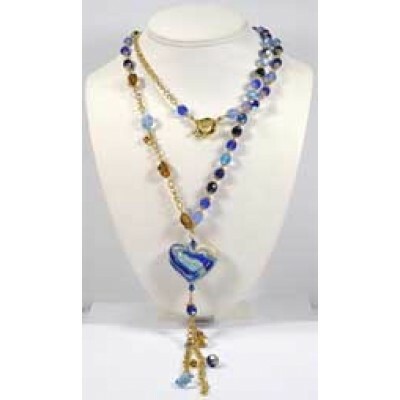 Working with Murano glass, Swarovski crystal and Czech firepolish glass, you'll get to practice your stringing and wirework skills. It should take around 3 hours to make. A lovely treat for yourself or someone you love. This project was featured in Creative Beads and Jewellery Magazine. Detailed instructions are available as a PDF download here. Tools are not included. You will need round nose and flat nose pliers; you will also need wire cutters. The kit is designed to be made by adults (16+) and should take around 3 hours to complete. You could easily incorporate your own beads into the kit if you would like to customise your necklace. Don't worry if your completed piece varies from the pictures, its nice to have something individual!